A solid remake of a game that’s past its time. Age of Empires: Definitive Edition is a solid remake of a game that’s past its time. We’ve had enough remasters now so that it’s pretty clear what people want from them: the game we remember, rose-tinted glasses included. We want our memories of the game, not the messy reality. When it comes to the sights and battlefields of the ancient world, at least, developer Forgotten Empires has given us exactly that. The Definitive Edition’s visual upgrade is a significant one, though you might not notice how significant it is until you fire up the classic mode to see what it looked back in 1997. It’s an overhaul rather than just a bit of HD polish, full of new art and animation, but it’s all in keeping with the original style. And it goes beyond aesthetics; the game’s simply cleaner and easier to parse. The result is that it certainly doesn’t look 20 years old, but neither does it look completely new. The focus then and now is on micro-managing lots of fiddly units—up to 50 in the campaigns and over 200 in custom games—and constant expansion. It’s not just the visual identity that’s been maintained despite the 2018 facelift; growing your towns and conquering other empires feels broadly the same as well. The rhythm of gathering, expanding and conquering is still hypnotic despite how familiar it is, but it runs out of steam quickly. The systems that set it apart, things inspired by Civilization, were a bit half-baked even in 1997, with trade, diplomacy and research existing in name only. The focus then and now is on micro-managing lots of fiddly units—up to 50 in the campaigns and over 200 in custom games—and constant expansion. Later additions to the series such as the idle worker button and the ability to queue up units have made their way into this version, however, so there are fewer headaches. The 19 empires share the small roster of units and list of buildings, with their most notable differences being some unique tech upgrades. Age of Empires manages to do a lot with very little, however. The Definitive Edition contains the Rise of Rome expansion, so that’s 10 campaigns in total. Missions run the gamut from anything-goes sandboxes to asymmetrical challenges with limited resources and fortified enemies. In a nod to Warcraft, there are also hero unit stand-ins in the form of mythological and historical generals. Objectives are simple but diverse, and maps are usually designed to force you into making concessions and choosing which of the tiny number of industries to focus on. An island or coastal map, for instance, makes wood the most prized resource. More wood means more ships; ships that can catch fish, hunt down enemies and transport armies. All that water means there are fewer trees, however, inspiring exploration and conflict as empires quarrel over tiny forests. A mountain of maps and objectives can’t disguise the fact that you’re playing with the same small deck, the same units and buildings, in every campaign. I still predict you’ll tire out before you finish every campaign. A mountain of maps and objectives can’t disguise the fact that you’re playing with the same small deck, the same units and buildings, in every campaign. By the time you finish the Egyptian tutorial, you’ll have seen it all. If you jump into the Rise of Rome campaign or play as Yamato Japanese dynasty in a skirmish, you’ll still be going through the same motions and fielding identical armies. The terrible pathfinding—units have a predilection for taking weird routes and getting stuck—and dull AI have made the jump to 2018 as well, and they still grate. They do seem a little less pronounced, but every unit is still completely useless without micromanagement. Since warfare doesn’t get much more complicated than growing a big horde and clicking on targets, fights are more like herding confused cats than commanding armies. These aren’t problems that are only apparent now, 20 years later, but time has certainly made them stand out. And while this is undoubtedly, as promised, the definitive version of Age of Empires, it’s not really the Age of Empires that makes people swoon when they remember it. The series started here, but its successor is the one everybody remembers. That’s when it started to lean into the city-planning elements a little bit more, and when we were finally able to build gates and thus actual, practical fortifications. We could make fortresses! In Age of Empires, we can make bits of wall. 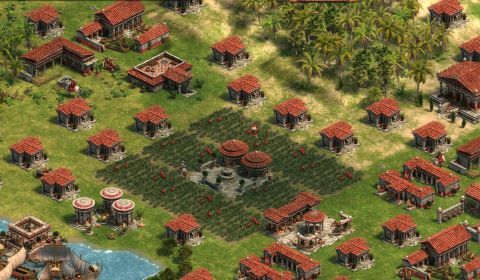 Age of Empires is once again poised to be overshadowed. The promise of 8-player battles and a revived custom maps scene is a seductive one, however, and might add some longevity to this resurrection. When multiplayer works, it’s a fast-paced brawl that hides a lot of Age of Empires’ problems with AI, but getting into a game is a bit of a crapshoot, with players sometimes not even making it into the lobby before being disconnected. This was an issue during beta, and while it’s not as pronounced now, it’s certainly still getting in the way. With 'Definitive Editions' of the later installments on the horizon, Age of Empires is once again poised to be overshadowed. If you have an overwhelming sense of nostalgia about the birth of the series, this does an excellent job of preserving it while making it considerably more palatable, but for a trip down memory lane, it sure is expensive.